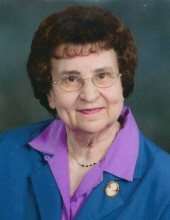 Rita Lisson (nee Rott), 95 years old, a lifelong resident of Naperville, IL, passed away on Saturday, January 12, 2019 at Edward Hospital in Naperville. She was born February 14, 1923 to her loving parents, Harold & Anna (nee Diehl) Rott. She is a fourth generation Napervillian and grew up on the family farm at Wehrli & Lisson Roads. She married the love of her life, Alfred LaClair Lisson Jr. on July 21, 1945. He preceded her in death on February 12, 1989 after 43 years of marriage. Rita attended SS. Peter & Paul School and Naperville High School, Class of 1941. She worked for Sears for 15 years in Naperville and Fox Valley in the catalog department. Rita was a volunteer in many clubs & committees: 4-H Club, Farm Bureau, Wheatland Plowing Match Association & Catholic Daughters. A devoted member of SS. Peter & Paul Catholic Church, she assisted with the church laundry for 60 years. She was an active member of the Mother's Club, serving as vice president & program chairman. Rita also belonged to the Prayer Network and was a Eucharistic Minister where she enjoyed visiting nursing homes. Rita taught Art Appreciation & Religious Education with her daughter, Marianne Kuhn. She enjoyed traveling, cooking, entertaining, reading and playing cards in three different card groups. Rita also managed the Lisson Farm in Virgil, IL, but by far the most precious gift was raising their four children in their storybook home in Naperville. Beloved mother of Gary (Diane) Lisson, Dave (Carole) Lisson, Marianne (Tom) Kuhn & Debbie (Jeff) Keating. Adored grandmother of Carrie (Eric) Winter, Renee and Kyle Lisson, Greg Lisson, Dana (Stacey) Smith, Sarah (Tim) Gemmel, Carolyn (Mark) Jaynes, Lauren Kuhn, Melanie Keating, Lindsey (Hunter) Lake, and Angela Keating. Great-grandmother "Grammy" to Nick, Gary and Alan Sifuentes, Miya and Jeremiah Smith, Samuel Jaynes and Isaac Gemmel. Rita is survived by her dear sister, Laura Rott and sisters-in-law, Bonnie Rott, Madeline Rott and Donna Rott. In addition to her parents and husband, Rita was preceded in death by an infant grandson, Jeffrey Lisson, and siblings, Robert, Marion (Charles) O'Connor, Vince, James (Mary Ann), Ralph, Bernard (Beverly), Carl (Josie & Barbara) and Donald (Nickie) Rott. She will be missed by many caring nephews, nieces, cousins and friends. Visitation Friday, January 18, 2019, 9:30-10:45 AM at SS. Peter & Paul Catholic Church, 36 N. Ellsworth St., Naperville, IL. A Mass of Christian Burial will follow Friday, 11:00 AM at the church. A luncheon will follow the Mass in the SS. Peter & Paul Ministry Center. Everyone will meet Friday, 2:00 PM at SS. Peter & Paul Cemetery, Naperville for graveside services. To send flowers or a remembrance gift to the family of Rita R. Lisson, please visit our Tribute Store. "Email Address" would like to share the life celebration of Rita R. Lisson. Click on the "link" to go to share a favorite memory or leave a condolence message for the family.